Wilwood Engineering Brake Kit - Open Wheel Racing UNIVERSAL - Brakeswap.com - Friction for the Win! The GP320 System features Wilwood’s competition proven dynamic rotor mount system, specially treated Super Alloy lightweight steel alloy rotors, and the highly efficient clamping force of the GP320 billet caliper for the most positive and fade-free performance available for sprint racing.Component Features: GP 320 Billet Aluminum 4 Piston Calipers with Four small pistons provide balanced distribution of the pad load for improved response and longer pad wear. Super Alloy Rotors: Unlike ceramic coatings that can flake away from the base metal during high heat cycling, Wilwood’s Super Alloy material controls heat transfer and provides a durable surface that can generate high friction for long, trouble-free duty cycles without the need for recoating. Dynamic mounting with Wilwood’s t-nut system isolates all thermal stress and distortion at the rotor mounting points caused by the different temperatures and expansion rates between the lightweight alloy steel rotor and the aluminum rotor mount plate. The rotors stay flatter and run truer to eliminate any possibility of pad knock-back or deflection. Dynamic Mount Rotor Plate: Lightweight billet alloy plate is machined with the slots to accept the rotor bolt t-nuts and adapt the rotor directly to 3 bolt sprint hubs. Wilwood 6211-CM Brake Pads A rigid caliper mounting bracket with premium grade fasteners and shim washers are included for secure, deflection free mounting. Wilwood’s GP320 Sprint Left Front Brake kit offers increased braking torque and thermal performance of the GP320 4 piston calipers. A definitive increase in braking and durability over traditional aluminum or steel rotor systems. Mounts are included for standard Sprint spindle to match the included 10.50 × 0.19” Super Alloy rotor. Also includes Composition Metallic brake pads, lightweight aluminum dynamic mount 3-pin rotor adapter and T-nut hardware kit. The Dynapro Single Left Front Sprint & Midget kits are a further evolution of a proven design from Wilwood’s 35+ years of engineering and producing the best open wheel braking systems. Dynapro single calipers have full 2.40 square inches of area for increased clamping force. Kits are offered with either Scalloped Alloy Steel Rotors for high heat or Aluminum rotors for maximizing weight saving on light braking tracks. Kit come complete with caliper, brake pads, caliper mounting brackets, caliper mount bolt kit, rotor and rotor mounting hardware. Wilwood’s new FNDL / DPS front and rear brake kit is one of DIRT modified racing’s most popular and lightest weight brake packages that is now offered from Wilwood at the most affordable prices ever. This popular package is now being bundled to provide our absolute lowest cost to racers in the DIRT Sportsman category, 358’s, and even for Big Block racers when track conditions and driving style are properly suited to this popular combination. Kit contains: Forged Narrow Mount Dynalite calipers and 12.19” x .81 rotors for the rear brakes, Dynapro Single calipers and 11.75 x .35” Scalloped LW rotors for the front. PolyMatrix B pads for both ends round out the contents. PolyMatrix B pads continue to set the standard and remain the pad of choice among DIRT. Wilwood calipers are Championship proven and used by more DIRT series racers than any other brand and provide unparalleled strength, clamping efficiency, and the absolute lowest unsprung weight of any brand. Wilwood’s GP320 Sprint Right Rear Brake kit offers increased braking torque and thermal performance of the GP320 4 piston calipers. A definitive increase in braking and durability over traditional aluminum rotor systems. Kit includes 10.50 × 0.19” Super Alloy steel rotor, Composition Metallic brake pads, lightweight aluminum dynamic mount splined rotor adapter and T-nut hardware kit. Dynapro Lug Mount Midget Inboard Kit Features: A fully engineered bolt-on brake system for sprint car quick change rears with 3.50 × 38 splined axles. With Super Alloy.780 vented discs and a newly designed dynamic mount rotor axle clamp, are the lowest rotating weights available for Sprint racing. The lightweight advantages of the Super Alloy rotor are high durability, long wear, and superior heat control properties of advancedSuper Alloy material technology. Forged billet DynaPro Lug mount calipers with Composition Metallic pads, produce superior stopping power and consistent fade-free response. Kit includes Axle Clamp with Dynamic Mount Rotor Adapter assembly with T-nuts and mounting hardware. Wilwood’s Narrow Dynapro Lug Mount Sprint Inboard Kit Features: A fully engineered bolt-on brake system for sprint car quick change rears with 3.00 × 46 splined axles. With an economical 12.19 x .810 diameter cast iron vented rotor and a newly designed dynamic mount rotor axle clamp. Forged billet DynaPro lug mount calipers with PolyMatrix B compound pads, produce superior stopping power and consistent fade-free response. Kit includes Axle Clamp with Dynamic Mount Rotor Adapter assembly with T-nuts. Dynapro Radial Sprint Inboard Kit Features: A fully engineered bolt-on brake system for sprint car quick change rears with 3.00 × 46 splined axles. 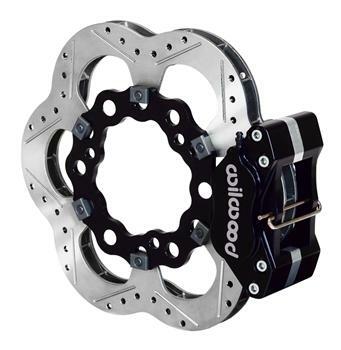 With titanium or Super Alloy.810 vented discs and a newly designed dynamic mount rotor axle clamp, are the lowest rotating weights available for Sprint racing. The lightweight advantages of the titanium rotor are fortified with the high durability, long wear, and superior heat control properties of advanced PolyMetallic coating technology. Forged billet DynaPro radial mount calipers with Composition Metallic pads, produce superior stopping power and consistent fade-free response. Kit includes Axle Clamp with Dynamic Mount Rotor Adapter assembly with T-nuts and Radial Mount Bracket and mounting hardware.